The Yogi is one of our biggest chalet apartments here in the excellent de L’Ours residence with the added bonus of its own sauna, a balcony in almost all the 8 double or twin bedrooms, and a balcony off the lounge and dining area so everyone can enjoy the views over the resort at meal times. To add to the appeal, all guests have free access to the indoor swimming pool in the adjacent Altitude residence. Furnished in the classic, comfortable Alpine style of all the apartments here, the accommodation has a warm ambience created by the wood-panelled walls throughout. Free Wifi, satellite TV, and hairdryers in every room complete the comforts. Access to the slopes could not be simpler, with the pistes and nearest ski-lift just 250m from the residence’s front door, for swift and easy access to and from the slopes. Supplements per person per night: Bath/wc/balcony £4, shower/wc/balcony £3. We update Chalet Yogi's details often, but facilities do change. e.g. some extras listed by the supplier as "free" or included might only be for the first time you use them, or for one time per party, then charged for further use. If any specific feature is essential to your holiday, make sure you ask us to confirm the details of it before you book your holiday. This package holiday to Chalet Yogi in Les Arcs, France departs Sunday 15th December 2019, for a 7 night stay on a "catered chalet" board basis. A local tourist tax (Taxe de Sejour or Kurtaxe) is levied by many councils in European ski resorts. It varies by standard and type of accommodation and is age dependent, so not everyone is charged. It's not included in the basic price of your holiday and is usually paid locally. For reference, the average charged in winter 15/16 was between 50p and £2 per person, per night.
. Ask for a quote when booking Chalet Yogi. Chalet L’Ours Brun Les Arcs France, Gatwick to Chambéry 15th December. 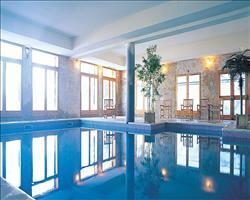 Chalet McKinley (... Les Arcs France, Gatwick to Chambéry 15th December. Chalet Petit Ours Les Arcs France, Gatwick to Chambéry 15th December. 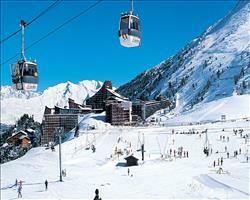 Chalet Winnie Les Arcs France, Gatwick to Chambéry 15th December. 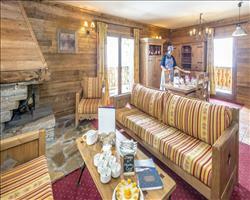 Chalet Matterhorn... Les Arcs France, Gatwick to Chambéry 15th December. 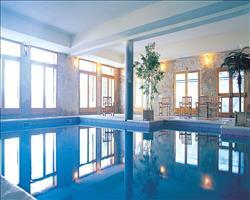 Chalet Aravis (Al... Les Arcs France, Gatwick to Chambéry 15th December. "Needs bigger kitchen & better food but views are stunning"
The chalet itself is very nice and I would go back, everyone in our party enjoyed it. It has stunning views over the resort, down onto 1950 and you can see Mont Blanc (most of the bedrooms have balconies). There’s quite a large communal area, which gives everyone the opportunity to sit down and discuss the day together. The whole place has a nice relaxing atmosphere. Great location as it’s just a short 50 metre walk to the first tow or you can go into the neighbouring building and get the lift from there. You virtually walk out of the chalet, across the road and go up the lift and you’re at 2000 with all the bars and restaurants. There was quite a lot of walking to do upon arrival as the coach drops you off a bit of distance from the chalet, but they organised for vans to pick our bags up and take them back down at the end of the week. It was a bit of chop and change with the staff who had been moved from a place in Italy to take over the chalet, which meant they weren’t particularly informed about the area (although this wasn’t a big issue). I’ve definitely been in better chalets in terms of the food. They did some pretty basic cuisine which lacked a bit of seasoning. There was a bit of difficulty with the staff as the kitchen area is so small, they couldn’t lay out 16 dishes in there so some people had to wait for their meals. There was an issue with them not being able to get bread through the week and some people didn’t get breakfast on the day they left (they’d been promised bacon baguettes). Very good chalet, the young lady and gent who hosted us were both excellent and we thought the location was great. Overall a positive review! "More than the Bear necessities ;-)"
One of the few chalets that have a private sauna - to be put to use whether you've had a great day skiing or just relaxing at the resort. 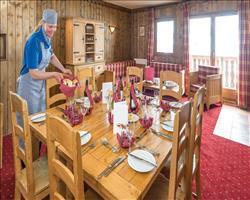 This is an ideal chalet for those who want a catered chalet in a good location, and it has fantastic service to boot. It's on the first floor of the complex, so you have easy access to the piste, lift and pool (check pool use rules before you book, as what's included in the holidays can change).